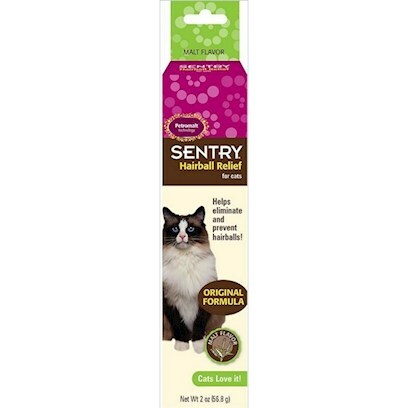 Home Categories Vitamins & Supplements Sentry Petromalt Tube Hairball Remedy For Cats 4.4oz. Sentry Petromalt Tube for Cats 4.4oz is an excellent pet medication that aids in the elimination and prevention of hairballs. One dose of petromalt is sufficient enough to quickly & easily alleviate your cat's discomfort due to hair balls. It also aids in the elimination of swallowed hair. This malt flavored medication helps relieve constipation, dry cough and occasional vomiting. To administer, place it on your finger or on cat's front paw where it can be licked off readily and offer to cats, between meals. To prevent hairballs in adult cats, feed a one-inch ribbon once or twice a week and brush regularly. Feeding a half-inch ribbon once or twice a week is sufficient for kittens.